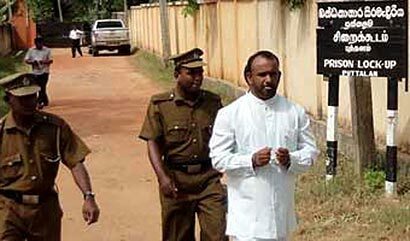 Former Provincial Councilor Ananda Sarath Kumara who was produced to Anamaduwa Magistrate Court was granted bail today by Magistrate Ranga Dissanayake. Kumara was released on two surety bails each of Rs.500,000. He was also instructed to appear at the Nawagaththegama Police everyday between 9-12 a.m. and to keep away from the teacher who had been allegedly harassed by him earlier. This person should keep in jail forever,uneducated stupid fellow. Recommend that you be catapulted into Parliament as a national list MP and be made the Minister for education replacing Hon SB Dissanayake who has become a bit stale.